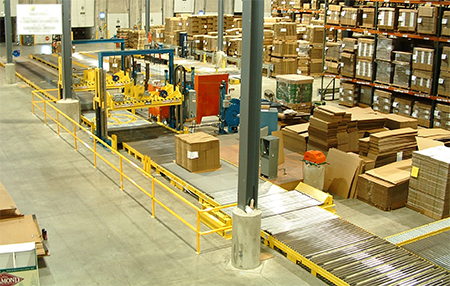 C&M Conveyor is a preferred supplier to the corrugated box industry. We have more than 30 years’ industry experience, having worked for hundreds of corrugated companies and thousands of box plants. We know how a box plant works, and we know the trends within the corrugated industry. We know how to boost your box plant’s throughput from receiving to shipping. Some of the products we offer to the corrugated industry include automatic chain transfer, strapper console, and moveable machine infeed and transfer car conveyors. Our customers tell us the reason they keep coming back is because we’re more than equipment in a catalog. We have our own in-house engineering and installations teams. With our knowledge and experience, we work closely with our customers to understand their problems. We often become part of our customer’s team and provide input during the design phase in order to provide the ideal system. Contact us today to learn how we can help boost your box plant’s productivity and find the best solution to your material handling problem.